Hugo is the the meeting note platform for teams that makes insights actionable and keeps everyone in the loop. It allows your team to instantly socialize meeting insights and connect these insights to your team’s existing tools. Your whole team has access to every important conversation, whether or not they were in the room. Every relevant meeting insight is actionable in team workflows, through native integrations with your team’s existing tools. Your business can centralize, retain and leverage meeting insights that would otherwise be lost or inaccessible. Where does Hugo fit in? 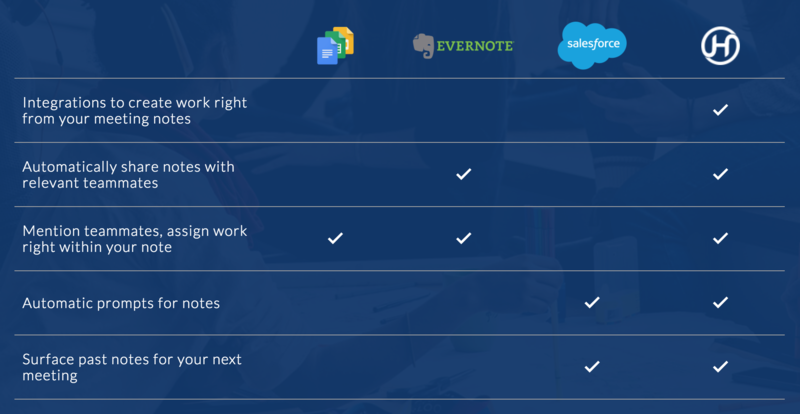 Hugo is a business-wide solution for meeting notes. It integrates with your team's calendar, and tools (to-do, project management and CRM) to automatically remind your team to save a note for each meeting, socialize meeting insights with the rest of the team and turns these insights into action in your team’s existing tools. Learn more about Hugo's integrations here. Hugo gives the team one place for knowledge that was previously fragmented and distributed across many locations, but integrates with your team's existing tools to create value in a very simple way. Hugo is the only true team-based meeting insights platform that recognizes meetings as a source of insights for action in your software stack. Compare Hugo to your current workarounds to see its value. Each company has one Hugo account. Look out for a link to join your Hugo team in your inbox, or ask your team Hugo Administrator for access. If you need help getting started - chat with us below.